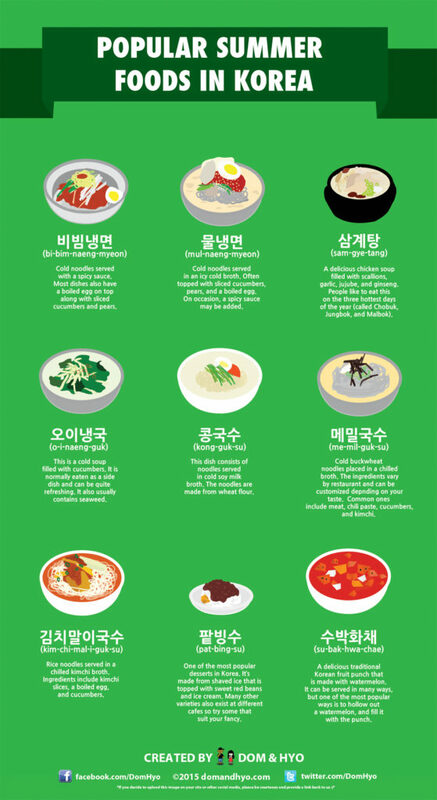 Enjoy these great summer foods for hot weather in Korea. I’m actually not a big fan of the cold noodles (must be because I’m American), but they are sooo popular here in the summer. 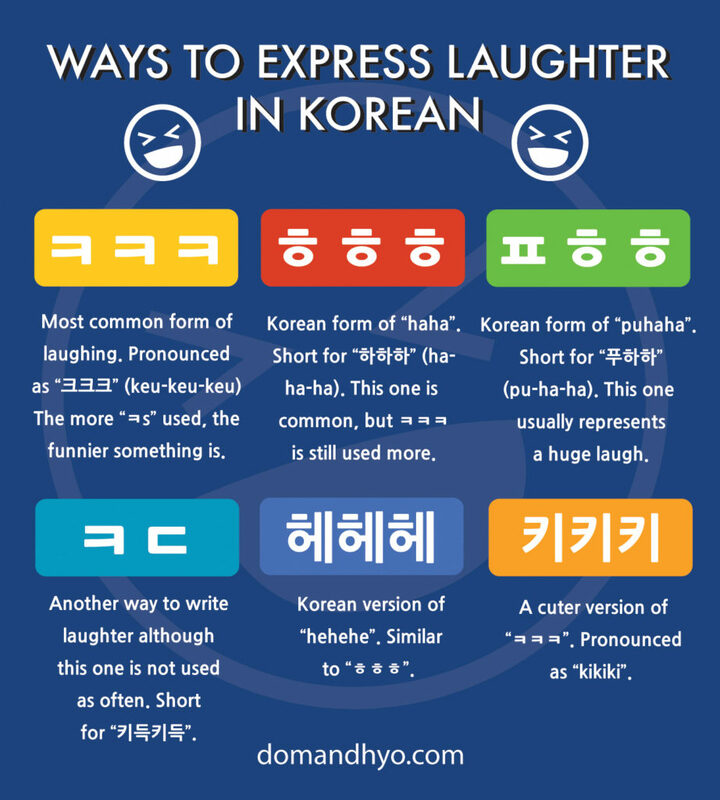 Check out the Dom & Hyo store to find souvenirs and gifts related to Korea. We have posters, t-shirts, postcards, and more. 비빔냉면 (bi-bim-naeng-myeon) = Cold noodles served with a spicy sauce. Most dishes also have a boiled egg on top along with sliced cucumbers and pears. 물냉면 (mul-naeng-myeon) = Cold noodles served in an icy cold broth. Often topped with sliced cucumbers, pears, and a boiled egg. On occasion, spicy sauce may be added. 오이냉국 (o-i-naeng-guk) = This is a cold soup filled with cucumbers. It is normally eaten as a side dish and can be quite refreshing. It also usually contains seaweed. 콩국수 (kong-guk-su) = This dish consists of noodles served in cold soy milk broth. The noodles are made from wheat flour. 메밀국수 (me-mil-guk-su) = Cold buckwheat noodles placed in a chilled broth. The ingredients vary by restaurant and can be customized depending on your taste. 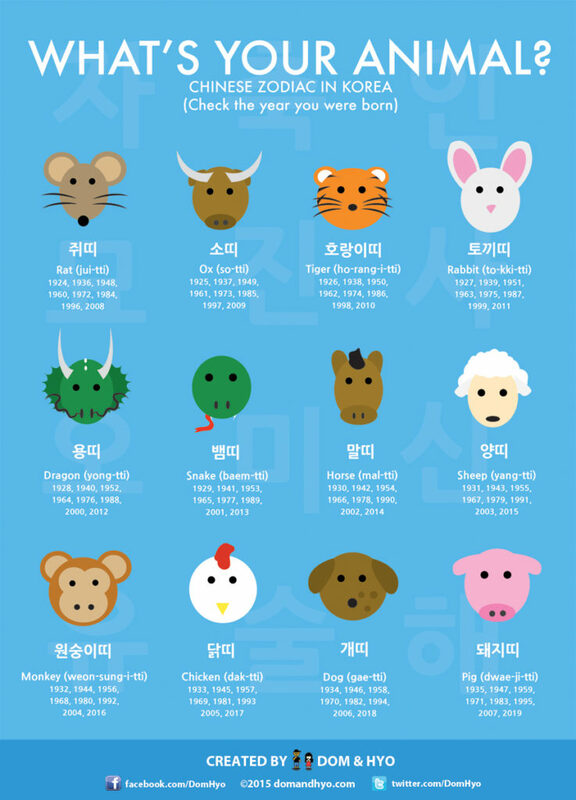 Common ones include meat, chili paste, cucumbers, and kimchi. 김치말이국수 (kim-chi-mal-i-guk-su) = Rice noodles served in a chilled kimchi broth. Ingredients include kimchi slices, a boiled egg, and cucumbers. 팥빙수 (pat-bing-su) = One of the most popular desserts in Korea. It’s made from shaved ice that’s topped with sweet red beans and ice cream. Many other varieties also exist at different cafes so try some that suit your fancy. 수박화채 (su-bak-hwa-chae) = A delicious traditional Korean fruit punch that is made with watermelon. It can be served in many ways, but one of the most popular ways is to hollow out a watermelon, and fill it with the punch.